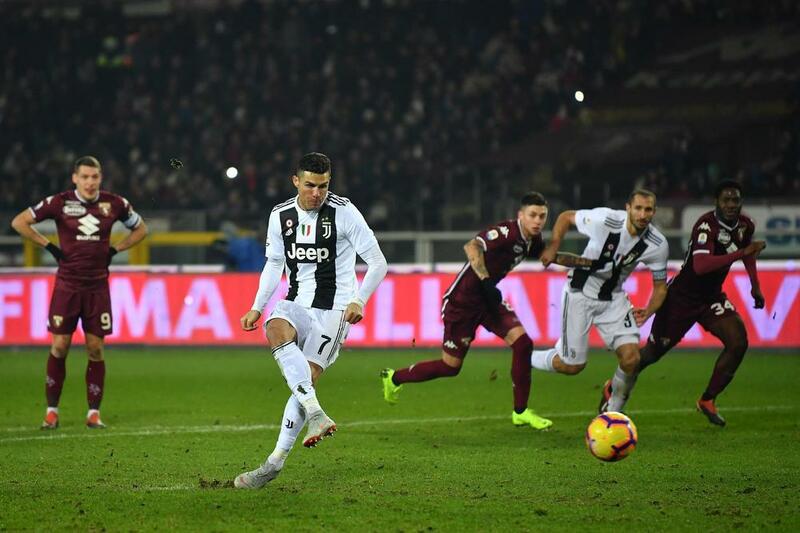 Cristiano Ronaldo's penalty gave Juventus a seventh consecutive Serie A victory as Torino's Simone Zaza endured a nightmare moment in a 1-0 defeat to his former club in the Derby della Mole. Torino held their own for 70 minutes in a cagey affair until Zaza dribbled haphazardly back towards his own box with Leonardo Bonucci in pursuit. The forward then sold Salvador Ichazo short with a terrible backpass and the substitute goalkeeper brought down Mario Mandzukic. Ronaldo converted despite Ichazo's best efforts for his 11th Serie A goal of the season, extending Juve's lead at the summit to 11 points. Salvatore Sirigu took a heavy blow to the hip early on and the Torino goalkeeper writhed in agony after making a fine reaction save from Ronaldo. Sirigu finally accepted defeat in the 20th minute, making way for Ichazo to make his first Serie A appearance for Torino since January 2016. His opposite number Mattia Perin – preferred to Wojciech Szczesny by Juventus boss Massimiliano Allegri – kept out Andrea Belotti's header and prevented Armando Izzo from scrambling home the rebound. Izzo had a better chance in the 52nd minute when he got in front of Leonardo Bonucci but headed Cristian Ansaldi's in-swinging free-kick over. Belotti then had a strike deflected behind and Juventus full-back Alex Sandro was fortunate not to be penalised for pulling Zaza to the floor in the penalty area. It had been largely lacklustre from the champions but a combination of Koffi Djidji and Ichazo thwarted Blaise Matuidi when he was on the end of Ronaldo's excellent low cross. Increasing pressure told - certainly when it came to Zaza's decision making – and Ronaldo netted decisively before collecting a needless booking for bumping chests with Ichazo after the keeper almost saved his penalty. Juve thought they had a second when Mandzukic converted Miralem Pjanic's free-kick at the back post, but Ronaldo flicked on from an offside position. Napoli can close the cap to single digits again if they win at Cagliari on Sunday but chasing down this Juventus machine looks like a futile exercise. They were below their best for most of this local argument but found an extra gear to apply decisive pressure when it mattered. In a performance that will have been enjoyed in his native Naples, Torino defender Izzo performed impressively on the right of Torino's back three to help keep Ronaldo on the periphery in open play. He was also a nuisance from attacking set-pieces and even found time for a spat with Mandzukic. All in all, Izzo ticked quite a few derby-day boxes. A combustible character, Zaza is always likely to have some sort of notable involvement in games like this. He scored a brace for Juve when they beat Torino 4-0 in the Coppa Italia in 2015. But his moment of madness is one to rank alongside his bizarre run-up and miss when Germany dumped Italy out of Euro 2016 on penalties. Unfortunately for Torino, Ronaldo proved more effective from 12 yards. Juventus entertain last season's Champions League semi-finalists Roma next Saturday, when Torino return to action against Sassuolo.